I am delighted to share another beautiful submission to the Monk in the World guest post series from the community. Read of for Jamie Marich's reflection "Jerusalem." During my first trip to Israel in June 2018, I had the privilege of meeting two individuals who shared key insights with me. The first was Alexandra Cohen, a Jewish woman I met through common friends of ours in a yoga community to which we both belong. 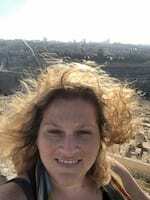 Alexandra (Arti) is a teacher and a writer who lives in Israel. In a riveting conversation that took place on a Saturday night in Haifa, she shared this magnificent reflection about the Holy of Holies as something that exists within us. Her teaching on the Holy of Holies corresponds with a core truth of yoga, specifically emphasized in the lineage in which we study. As she observes in her teaching, so much of the conflict and bloodshed is about where the external expression of the Holy calls home. Is bloodshed and conflict among peoples inevitable unless we recognize that the Divine is within us? Does fear drive us to do insane things to each other because we somehow fear that we’re missing out on something? Something magical, mystical, special, and chosen? 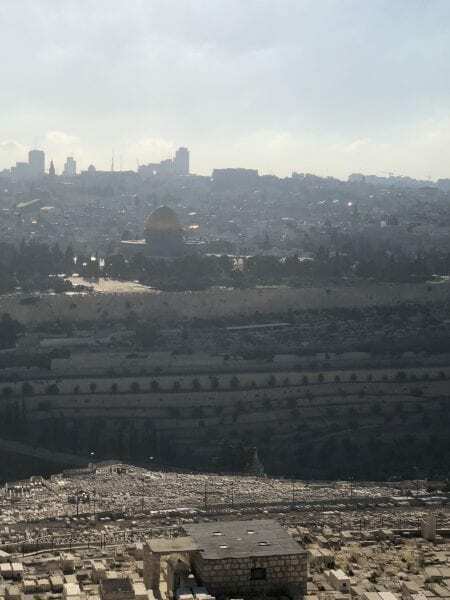 As I travelled to Jerusalem and toured through the sacred city the following day, the questions prompted by Alexandra’s insights stirred within me. I hope that my new friend continues to share her ideas on this with the world because in them, I believe, exists a pathway to greater peace and enlightenment. The next evening at sunset, a Palestinian taxi driver named “Jimmy” offered to take me up to the Mt. of Olives, the famous place where Jesus prayed on Holy Thursday before he was arrested. Jimmy told me, “It’s the best view in all of Jerusalem. You can really hold the whole city in the palm of your hand.” And when I got out of the cab to take in the view shown in my pictures, I was amazed. I extended my hand and discovered that the entirety of the Old City rested on my palm. I was so glad I accepted this offer to take in the view. Experiencing Jerusalem in the palm of my hand is an experience I can never forget. As I engaged in that practice, I savored a wild sense of integration about what Jimmy taught me and what Alexandra taught me. I am a Catholic-Christian by heritage and in meeting both Israeli and Palestinian people on my journey, so many of the dots about my spiritual journey connected. What I learned was so overwhelming I found it difficult to put into an essay or any more substantive discourse. I hope that this poem and these pictures offer you a glimpse into my internal process of engaging with the Holy Land, its complexities, its perils, and its wonders. How you engage with Jerusalem may teach you more about yourself than you ever realized. Jamie Marich, Ph.D., LPCC-S, LICDC-CS, REAT, RMT travels internationally speaking on topics related to EMDR therapy, trauma, addiction, expressive arts and mindfulness while maintaining a private practice in her home base of Warren, OH. She is the developer of the Dancing Mindfulness practice (www.dancingmindfulness.com). Jamie is the author of four books, including the popular EMDR Made Simple. She is co-author with Dr. Stephen Dansiger on her most recent book, EMDR Therapy and Mindfulness for Trauma Focused Care.